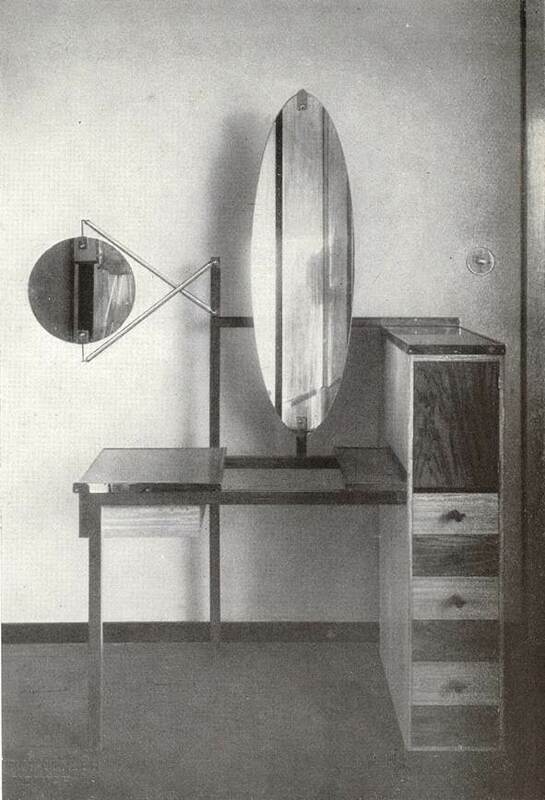 Marcel Breuer, Dressing Table, 1923, Hous am Horn, Weimar, Germany. Courtesy of: Ein Versuchshaus des Bauhaus in Weimar (edited by Adolf Meyer), Munich, A. Langen, 1925. The article “Breuer’s Furniture, Moholy-Nagy's Photographic Paradigm, and Complex Gender Expressivity at the Haus am Horn” has been published in Issue 50 (Winter 2013) of Grey Room. The article takes a phenomenologically inspired approach to the interpretation of Bauhaus furniture and interior design with an emphasis on the productive interaction of different technological media. It explains Breuer's early interactive furniture and room designed for the Weimar-era New Woman at the model house of the 1923 Bauhaus exhibition as an attempt to bring to attunement the increasingly optical experience of the city and the tactile world of the private interior, as well as to “train” perception for a subtle engagement with urban life. In conversation with mass media images and new codes of urban behavior, the furniture, especially the dressing table, allows for the fashioning of the New Woman's identity as an embodied experience, by taking inspiration from photographic processes inscribed in its structure and functioning. Edit Tóth received her BA-MA from Lorand Eötvös University, Budapest, and her PhD from Pennsylvania State University (2010). Currently an independent scholar, she has taught at Georgia State University and will be teaching at Juniata College. Her research activity focuses on twentieth-century art, photography, and design. She has published in English, German, and Hungarian. Presently, she is writing a book on the Bauhaus.